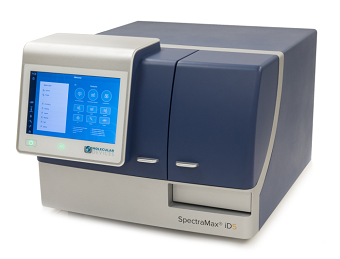 The SpectraMax® iD5 Multi-Mode Microplate Reader is the complete laboratory solution that comes with built-in absorbance, fluorescence, luminescence, time-resolved fluorescence (TRF) and tunable fluorescence polarization (FP) read modes. The system can be further expanded to include bottom-read luminescence, TR-FRET, HTRF®, BRET, dual luciferase reporter assays with injectors and western blot detection. Using the built-in near-field communication (NFC) tags, the SpectraMax iD5 plate reader automatically detects the identification code of the filter to recognize the slide and filter configuration, eliminating confusion and simplifying filter workflow. The SpectraMax® iD5 plate reader is injector-ready allowing expansion of laboratory capabilities to include flash applications such as dual luciferase and ATP assays. SmartInject™ Technology features low dead volume (10 µL), overflow protection and ensures equal mixing across the plate for high-precision experiments. Superior optical system includes a xenon flash lamp and features an ultra-cooled photomultiplier tube (PMT) that reduces background noise for excellent sensitivity and a wide dynamic range. Featuring temperature control up to 66 Deg C, linear, orbital and double orbital shaking, a four-monochromator optical pathway with high efficiency gratings, option to use filters or a hybrid mix of monochromator and filter based reads, well scanning up to a 20 x 20 read matrix, spectral scanning and detection of plate formats from 6- to 384-wells, the SpectraMax iD5 reader is the complete solution for all research needs. Utilizing an optional enhanced TRF detection module, the SpectraMax iD5 is capable of scanning and analyzing membranes for western blot data. The SpectraMax iD5 is HTRF®-certified, DLReady and SpectraMax®DuoLuc™ certified. Microplate reader assays requiring infrared (IR) or red-shifted assays can be read with great sensitivity using the iD5 reader’s filter system. QuickSync Data Push technology reduces the amount of time spent on collecting data, allowing the user to interact with the data any way the user wants from anywhere he wants. SoftMax®Pro Software is the most published microplate reader control and microplate data analysis software package and is 21 CFR Part 11 compliant providing complete validation protocols.